Everyone get ready to have some phenomenal ideas, because the 2018 Pantone Color of the Year is Ultra Violet! I love when knitting inspiration finds me. Anything that can give me a fresh or interesting way to approach my projects is always welcome. When Pantone released their 2018 color of the year I realized that I can’t remember the last thing I knitted in violet. It’s such a beautiful color and their choice really made me wonder why I hadn’t used it! I saw this as a fantastic opportunity to explore for myself new patterns and yarns in this captivating color, and decided to share my findings with you. Some of my favorite yarns already feature this striking shade. Luminance Lace Yarn makes a fabulous version in color “Brilliance”, Stroll Hand Painted Yarn features vivid magenta and icy blue highlights that tango between tones of violet in “Gemstone”, and the Wool of the Andes Sport line features the (always stunning) Amethyst Heather. I have a very exciting answer for you: I’ve brought suggestions! This warm and comfy wrap features beautiful cables which highlight the array of deep purples and reddish pinks in Wool of the Andes Sport’s Amethyst Heather. 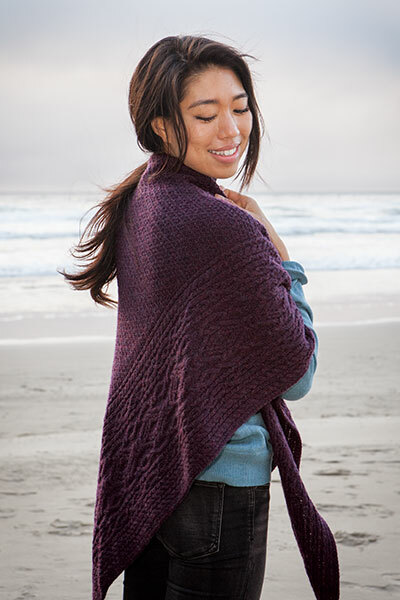 And, if being gorgeous isn’t enough, this 100% Peruvian Highland Wool wrap will keep you toasty even in the crisp breeze of a cold coastal beach! Definitely an exciting knit. 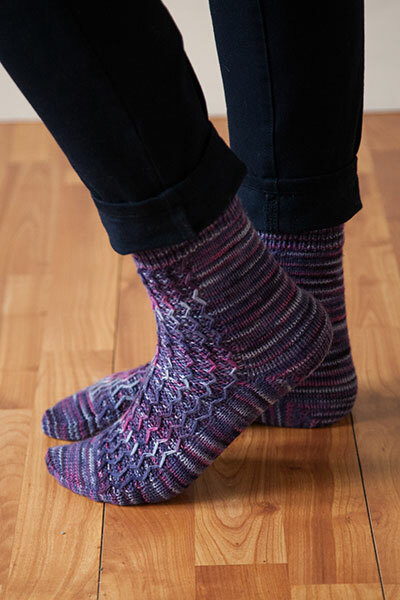 These socks are made with slipped stitches that help to bring the short color repeats of this Stroll Hand Painted Yarn in color “Gemstone” out into beautiful stripe patterns. The cuteness of these socks is matched only by their softness, and with 75% Superwash Merino Wool and 25% Nylon they’re also extremely washable (something you may value in socks)! Kinross Avenue Wrap I am in love with this wrap! Featuring a stockinette body this piece uses a main base of stockinette stitches accented with small amounts of lacework and beading to create a modern and classy style that really showcases this vivacious violet. The shimmer and drape of Luminance Lace Yarn in the color “Brilliance” is perfect for making a luxurious wrap you can wear when you find yourself in need of a dramatic burst of color. I know I’m excited by these ideas and I can’t wait to try crafting some regal new duds now. If you’re feeling the same I cordially invite you to immediately head over to our website and check my new favorite color: Violet! Finally, a color of the year I can actually wear!